I took Milo to the Arboretum yesterday to get 13 month pics with him. He did great and had fun playing for the camera until a big boo boo happened. 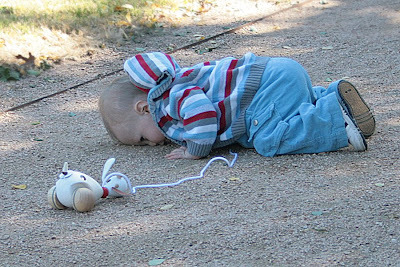 He was leaning down to get his toy when he lost his balance and fell face forward and whacked his head on the gravel path. I happened to be photographing in burst mode when he fell so I got it all on film. 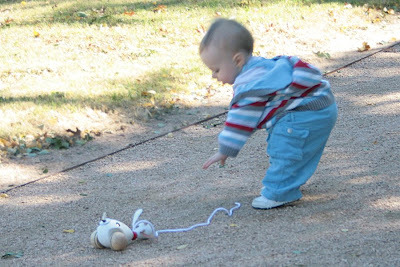 It happened so quickly that even though I was in burst mode I didn't even get the fall, just him leaning over to get his toy and then WHAM! I was too far away to have done anything about it but I still felt so bad that I hadn't caught him (I cropped the pics so they look like I was closer than I actually was). He had dirt all in his mouth and up his nose. I took him to the Dr. after to get the second of his flu shots and while we were there asked the nurse if she could clean the dirt out of his nose. He got so upset about that that he didn't even notice when she gave him the shot. "oh, let me get my toy"
I immediately stop shooting and went and picked him up. We just sat there on the path cuddling until he calmed down. 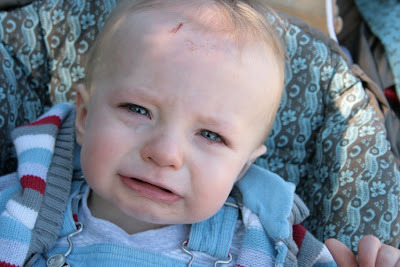 He was fine until I sat him in the stroller and picked up the camera to get a photo of the damage. Then he started wailing again. Apparently he doesn't like me photographing his war wounds. Rocking the bandage on his head. For the rest of the day people asked me what happened to him. I can't believe those photos...I hope you got some good ones, too. Oh poor little guy! 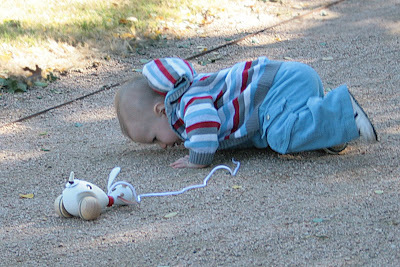 I can't believe how you got the pictures of the fall. ouch! 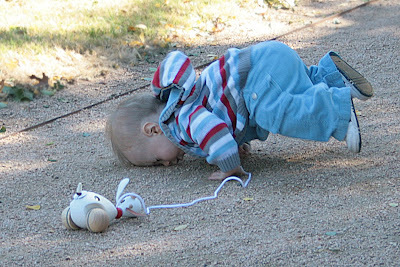 Sure hope you were able to take some cute ones before the fall! Poor Milo :( Is his head feeling any better? OK, I can only laugh because I know he is OK now, but the shots are pretty funny! 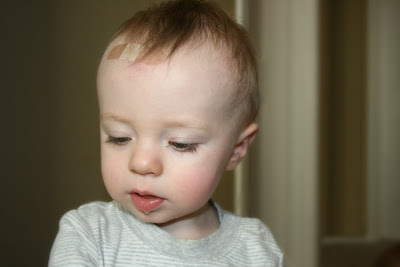 I'm sorry that he got the boo boo, and I'm sure it was most definitely not funny when it happened! You'll have to post the good pics too! By the way, I think we have the same stroller :) ! I recognize the pattern! OMG! I cannot believe you caught that all on film! Glad he is okay now! Give him hugs for us.